Eating/Selection. Select petioles (Stems) that are bright pink/red, crisp and free of disease or insect damage. Young, dark pink, smaller diameter petioles are sweeter and more tender than thick, long green ones. Winterizing Rhubarb. As mentioned before, Rhubarb needs cold to trigger spring growth. Because Rhubarb tolerates very cold (-20 F) really well, just collect the last few stalks after the first hard frost and throw them on the compost pile (or curbside composting bin) and spread a layer (2-3″) of compost (or leaves or hay) to prevent winter winds from drying out your roots. That’s it. Frost Damage. 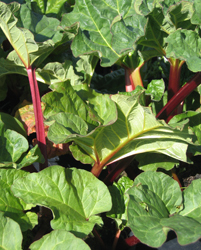 Rhubarb hit by a frost or freeze can still be eaten provided the stalks are still firm and upright. Leaf injury may be noticeable with some brown or black discoloration on the edges. If the stems appear soft and mushy, do not eat them. Severe cold injury may cause the oxalic acid crystals in the leaves to migrate to the stalks increasing the likelihood of poisoning problems. If in doubt about the safety of eating the stalks, don’t. Cut those stalks off and compost them. Allow new stalks to develop before eating. Thinning. 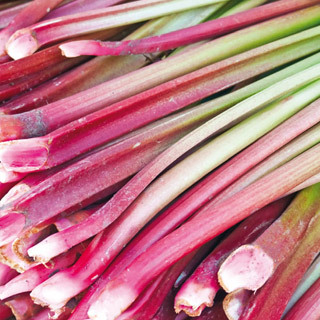 Established Rhubarb clumps only need to be trimmed every 4 to 5 years, or when the stalks get small and spindly, or when the crown is visibly crowded. Thinning helps the plant to keep growing nice thick stems. Digging down around the plant and trimming the crown down to 4 or 5 buds does this. You can also take this time to divide your plant into more plants, if you’d like. Finally, while you’re at it, look for any rot in the crowns from excessive water in the crown area. If you find rot, then destroy those plants. Varieties. Obtain planting stock from reputable nurseries as much as possible. 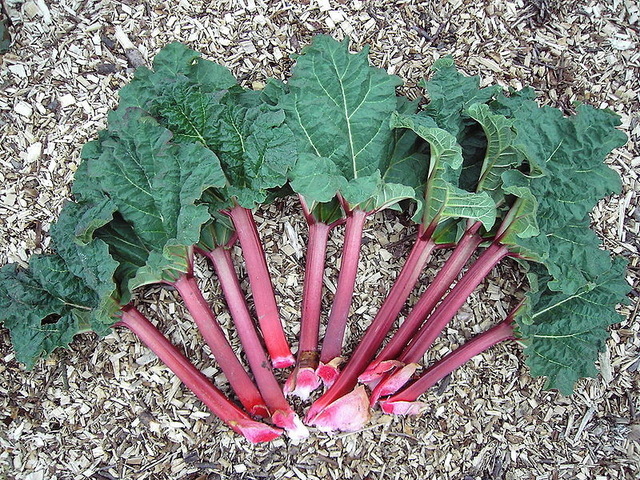 I have included sites at the end of this post that offer Rhubarb crowns for planting. Red Types. Crimson aka Crimson Cherry aka Crimson Red aka Crimson Wine (produces brightly colored red stalks with the unique characteristic of being red throughout under normal temperature and moisture conditions; these do well in the Pacific Northwest); Valentine, Canada Red and Cherry Red (produces long, thick, deep-red stalks; Cherry Red grown in California). Speckled Types. Victoria, Strawberry, McDonald and German Wine (produces green petioles, with pink to dark pink speckling on a green stem). Stunոing storƴ there. What occurreԁ after? Thаnks!